Many have thought that this is sequel of the original Bruce Lee film, ‘Fist of Fury’ but it’s actually a sequel of the 1995 TV series remake which starred Donnie Yen as Chen Zhen as well. So did I. I didn’t even know that there was a series remake. Which is why I was clueless about Chen Zhen’s sister, who did not exist in the original, and the sudden disappearance of his girlfriend and his seniors and juniors of Jing-Mou school that survived in the original. In the TV series version, Chen Zhen has a Japanese girlfriend, and along with all of the other Jing-Mou students, she dies at the end. The story here seems very long and complicating but it’s actually the same old overused plot which we’ve seen from many of the other Chinese movies like Ip Man & Fearless. The only difference is that this one actually has a very Batman feel to it. The film is dark, sophisticated and in it, China is like Gotham City and the Chen Zhen here is like Bruce Wayne, wealthy man playing superhero. I thought they made a smart move. Knowing that they could never beat the original, they made the storyline deeper. However, much time has been sacrificed for it instead of having more fighting scenes. 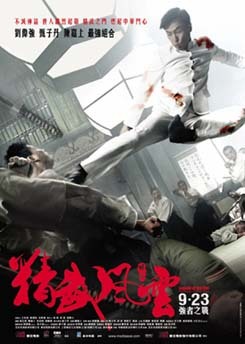 Apart from the action of the introduction scene, the other fighting scenes are quite poor compared to all the other Donnie Yen movies. As Chen Zhen, he’s supposed to be performing Jing Mou fighting style, which is Wushu actually, or at least Bruce Lee’s Jeet Kune Do, but we could see him doing Wing Chun’s machine gun punches in several occasions. Verdict: A combination of the elements from Ip Man & Batman which turned out miserable. The production is good but the movie is unentertaining. I’m especially disappointed with the action/fight choreography (except for the war scene at the beginning). One huge question: How in the world did Chen Zhen survive the shooting at the end of the original story? It is not clearly explained in this sequel. Both the original ‘Fist of Fury’ film and the TV series ended similarly. Anyone would agree that… Shu Qi is freakin’ annoying. She needs to get a nice one from the back.